In 2013, Debbie Adler's Sweet Debbie's Organic Treats: Allergy-Free and Vegan Recipes From the Famous Los Angeles Bakery proved that cooking for those with allergies and food sensitivities doesn't mean giving up dessert. 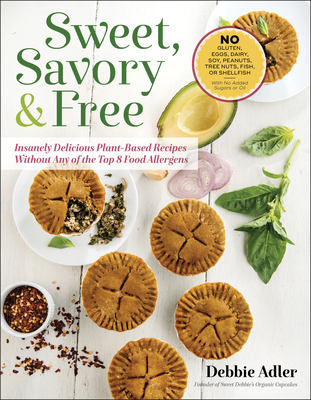 Now Sweet Debbie goes savory with more than 100 plant-based recipes free of the top eight food allergens--dairy, eggs, peanuts, tree nuts, soy, wheat, fish, and shellfish--plus free of refined sugar and oils. Debbie's super satiating, divinely delicious, and accessibly easy-to-prepare recipes show just how incredible, versatile, and flavorful allergy-free, plant-based cooking can be Her entrees, pastas, soups, sides, breads, and sweets are a guaranteed--and guaranteed safe--hit for school, kids' parties, work events, and more. Debbie Adler is the owner of the nationally renown, allergyfree, vegan, glutenfree and sugarfree bakery Sweet Debbie's Organic Cupcakes in Los Angeles. She is also author of the critically acclaimed, award-winning cookbook Sweet Debbie's Organic Treats: Allergy-free & Vegan Recipes from the Famous Los Angeles Bakery. Debbie has appeared on national television and radio shows such as NBC's Nightly News and NPR's Here & Now, as well as in the Los Angeles Times and other national publications.